Today's European releases aren't very surprising - It's basically Monday's American update, plus one more game which was expected to be coming out soon. 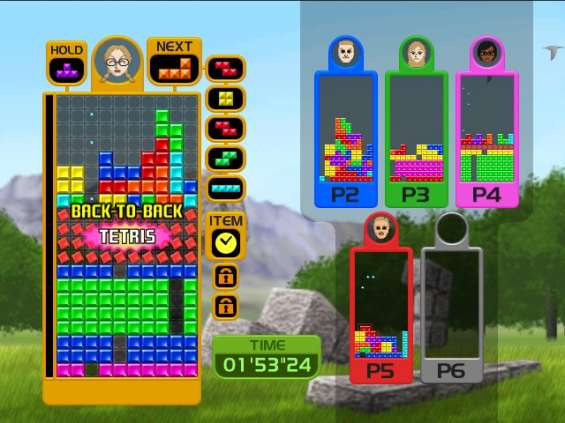 Tetris Party is the latest installment of the endlessly entertaining Tetris series. With 18 different gameplay modes and an online versus mode, this is yet another refreshing take on the series and recommendable to any puzzle game fan. In our review we do mention that it's probably going to be a bit more appealing if you're going to be playing multiplayer - The single player modes are fun, but won't hold your attention for too long. This costs 1200 Wii points. The Incredible Maze is a game by Digital Leisure, the creators of the popular arcade game Dragon's Lair. The basic concept is simple - Tilt the Wii remote or Balance Board to move a ball through various mazes. As we unfortunately found out, however, it only looks interesting in screenshots and videos - Much like Dragon's Lair, once you start playing it, you'll realize how shallow and boring it really is. This costs 500 Wii points. The only game that's somewhat of a surprise is Home Sweet Home, by the newer developer Big Blue Bubble. In this game, you play an interior designer who is asked by various clients to decorate their homes. It looks fairly interesting for those who like games such as The Sims, but it's anyone's guess if the game is enjoyable for a longer time. Look out for our review in the next few days.This costs 1000 Wii points. Check out the interview with Big Blue Bubble which we did some time ago. Sadly, if you were expecting Alien Crush Returns, Strong Bad Episode 3 or Space Invaders (Which was actually promised for an October release!) this week, you'll have to wait longer! Also available today, but at a later time, is some more downloadable content for Mega Man 9 - This time, you'll be able to download the special stage, hero mode, and superhero more, for only 100 Wii Points each. What about the new MM9 DLC? Is it available now? I can't imagine Home Sweet Home as possibly being worth the asking price. And yes, the remaining Mega Man 9 DLC was released as well - Hero Mode, Superhero Mode and Special Stage, for 100 points each. Anyway aside from Tetris this is the second naff update in a row...my take on this is as follows. I think part of the problem is publishers as much as anything. The developers are not pursuing publishing in other regions…personally Nintendo should be more of a Mother Goose in these situations as it stands WiiWare will be very fragmented (and we’re not even into year#1 yet) and Nintendo just crippled the thing that could unify it. I am thinking Alien Crush is pushed back to next month possibly December. Nothing appering in the shop channel here in Australia unlike last weeks stuffup where Street Fighter was missing this week everything is missing . Why these stuff ups is happening is beyond me . But still i check in the shop channel later . I be looking forward to the review of Home Sweet Home . I hope Home Sweet Home will hold up, especially at THAT asking price! Maybe i will get tetris, just not sure i will play it enough though, as for the others not interested in them really. How many wii points is Home Sweet Home? This week's releases for Europe are a bit better. But what about orbient and cubello. DANG! it is so annoying, another half a month before we can even begin to hope to see them. Finaaly they apper in the Australian shop channel . Decided to look thru the instructions for Home Sweet Home & if the review give it enouth score i would download it . How does it look via the Instructions, KP? Well, Tetris is decent and you got 3 games this week. It could be better, obviously, but it's not a "bad" week. I can't believe Home Sweet Home is 1000 points. What a ripoff. But other than that, pretty good week for Europe. It's just like our week plus HSH. Home sweet home looks pretty fun to me. it's still just 10 bucks. thats not that bad. I remember liking the original Sims back in the day and it looks about like that, but with an objective to follow. I've got TP now, but HSH doesn't look too bad, though it's unclear whether or not it's worth it. If only I had ACReturns!!!!! WOW! Europe/Austrailia ALREADY GOT Home Sweet Home!!! Hope we get it soon!! I know I want it!! Can I HIGHLY RECCOMMEND Something to the WiiWare World Administrators or Writers... HOLD OFF ON WRITING A REVIEW for Home Sweet Home!!! I don't want some crappy review score, FOR THE LOVE OF GOD... don't give me ANYTHING BELOW a 7!!!!!!! US get 4 games, EU get 3 games. The heck? Oh, and has anyone been able to load the Wii Channel? I keep getting a 'Error Code: 205958' (from yesterday and this morning after and ****ing update was required and meant I can't use AnyRegionChanger because I didn't put a custom ciso on my Wii). I guess it means the server is still down? Starwolf what do you mean you lost world of goo? Don't games from other regions work any more ? That means the only other time we can get it is November!!!! That just ruins the whole so called "Monthly" episode scheldule doesnt it! Thank you Nintendo/Tell Tale Games! Ok, the long wait for Art Style games, not getting goo on wiiware at all etc, is infuriating but we DID get tetris party. Online tetris = sweet! (aka bye bye social life) Besides I have a day job and would have to call in sick if I wanted to even scratch the surface of all the great games the US got in the past couple of weeks. Thank the lord for small mercies. You live in England with a PAL Wii. None of us are getting it or are supposed to have it. I don't know why people are calling it a good week (it might be a good week), but this isn't a week it's a FORTNIGHT, get it straight. Well like the tip said we got TP (soon on my Wii). I'm starting to think that NoE's WiiWare will never catch up with NoA's at the recent pace we have been going. By realeasing the services every fortnight you have to release at least four games, not two or three. Onto the new release, HSH. I've played the HSH demo for PC. Not bad, but not my kinda thing. Maybe if they added some Wii exclusive content and is no direct PC port. BTW, it isn't a Sims clone, you don't control the people, it's only the decorating part. Congrats to TIM and TP for having the release dates close to the US, atleast some developers know the process. Pretty weird that we didn't get Strong Bad. I'm kind of interesting in Home Sweet Home, though, but it sounds a bit repetitive + it costs 1000 points. In addition to that games from other regions won't work. If you used starfall the patches it made were overwritten. You can't downgrade with anything (to my knowledge). Changing area setting in AnyRegion changer won't work either. Last but not least Gecko OS rebooter and menu loader and other tempory region free channel solutions will fail to work. So for now i've got the game but no way of runing it. World of Goo would have still worked if I had bothered to dump the filesystem, edit the file and reinstal but this up but if I undferstand what Wiibrew is saying right the filesystem can no longer be dumped and I wouldn't be able to reinstal as I didn't get a cIOS instaled before the update. Also apparently thecIOS would have allowed me to downgrade but given the poo of this WiiWare update you can hold back un til you beat World of Goo. In short no is the answer and you might not be able to visit any countries anymore. I got that same error when visting America and Japan yesterday but not the UK. Which countries do you get the error on? I can still use AnyRegion changer but the shop country is about all I can change. Ok I have noticed a lot of comments on this latley, so my question is this homebrew channel and getting games from other regions legal? Also I think NOE should hook you guys up with some Gyrostarr! "Much like Dragon's Lair, once you start playing it, you'll realize how shallow and boring it really is. This costs 500 Wii points." Isnt the PC version worldwide? Unisgned code isn't approved by Nintendo and voids you warrenty. However the way I saw it was I'm still buying the item with Wii Points. But Nintendo isn't singing on the same hymn sheet and sees this as being the same as piracy...it makes me being a legitimate user really question my actions as the only reward I get is the moral high ground (as I bought it with money which a large percentage of 2D Boy gets which is the important thing). The thing is homebrew allows you to do many of the features Nintendo promised on the Wii but didn't act on such as region free games (btw, from my tests of a Japanese copy of Wii play that still works) and being able to copy any save to SD card...I think it is stupid how Nintendo don't let you copy say Mairo Kart and Super Smash Bros Brawl (I know its because of Wi-Fi informwation but they really should have had that as a second, uncopyable file kind of like how say PSO on the gamecube handles things) yet if you send your Wii in for repair they won't take any action to back up or copy these saves...they just stick to their story of "copy it to the SD card lulz". I'm starting to get the feeling that the Art Style series is US-only for the time being, due to its original Japanese exclusivity. I just hope Nintendo don't decide to hold them off for Hanabi Festival 4, 'cos that would mean waiting until March 2009 or even May 2009. Either that or they'll release all three once the third is out in the US. @RadioShadow: To my knowledge, the UK server has been fine - I was using the Shop Channel no less than yesterday evening. I blame teh haxx. Nintendo of Europe really need to scrap this fortnightly release schedule for the US one, because this update really sux. i think its just because they are new games, they need longer to translate to the various countries. Hey, at least you guys have MaBoShi on us. I've been really looking forward to that. I'm starting to get the feeling that the Art Style series is US-only for the time being, due to its original Japanese exclusivity. If that were the case Nintendo would be planning very far ahead with rating them. Yeah really. Don't get me started on that. Especially with the VC. I'm still waiting for games like Sonic & Knuckles, and my friend is waiting for Beetle Adventure Racing. @WiiloveitOnline: Well my Wii might be ****ed. My Wii was set to open the Wii JP Store. Now I did change my Wii back to the Country 'United Kingdom' before I updated. Now every time I go into the Wii Channel, it mentions blah blah your country Wii setting was Japanese and it's now UK. Blah blah all your gifts will have been lost (this is standard). Then it connects and comes up with an error code which according to Nintendo's website, there server is down or there is something wrong with my router (BS). But it seems people are having no trouble getting into the Wii Shop Channel. Maybe it will fix itself tomorrow. I hope. If you like the type of game, HSH is cool. 50 levels/"missions", and decorating your own room. Cannot believe we don't have Gyrostarr yet. Is Home Sweet Home anything to be interested in??? @RadioShadow: I once had iternet connection problems, and when I noted down the error code and rang the Nintendo cutsomer service number - +44 (0)870 6060247 calls charged at national rate - I found that the service was pretty good, so if you really need some help and dare to risk it (they might not be as nice if you've been fiddling around with your system), it's certainly worth a try. In the menatime though, you can get a rough idea of what and error code may mean here (providing you got one, of course). Home Sweet Home is a casual PC game that was ported over to WiiWare. It recently received a sequel, Home Sweet Home 2: Kitchens & Baths. Both retail for $19.99, so 1000 Wii points is half price of the originals. It will be interesting to see how the WiiWare version stacks up to the PC game. If it still doesn't work give it more time (Codestorm don't work weeneds) and if you do contact codestorm use some line about you had to do it for sending/recieveing gifts to relatives. And be preapred to be on hold...for a long time. Also when rining codestorm if you come clean about the story the repiar will be misuse which I think is £70...if you delete the homebrew channel* and the Wii shop doesn't say Previous country: Japan (or another country you shouldn't be able to) it might be free or you could be charged anything. Thankfully Nintendo will foot the bill for delievery (by giving you labels to print). -As ar as I know they are not allowed to check the message board and worst case scenario is they'll use the diagnostic disc to get your Wii shop account number and swap this data onto a new Wii...so make sure you back up all saves with savegame extractor before sending it off. @Otty Ott. Thanks for the info about Home Sweet Home. Not my sort of game but interesting to know it is a PC port. I remember that offer - it even included buying another Wii points card. £16 for 4000 points? Sweet! The thing was that I didn't have my console online at the time, so didn't bother. Hopefully, they'll do something similar in the future, but in the meantime, this offer that Tesco.com are doing will have to suffice, at the equivalent of £5.99 per 1000 points. Thanks for that, it'll help me gather opinions whilst I wait for the review. The Difference is rather big but understandable. due to translations and all of that. Still frustrating for us. Also, with Home Sweet Home, that probably won't stay EU exclusive for long. MaBoShi though, i'm sorry US Gamers haven't got it but since they have loads of exclusive games so far and i own MaBoShi, Muwahahahaha to America. V.I.P. Casino: Blackjack/Gyrostarr: One cannot understand my frustration with HVS for not having even started work on European versions of these games. I don't care for V.I.P Casino but Gyrostarr i want. At least releasing V.I.P Casino Blackjack would show they're supporting PAL WiiWare Regions and that's all i want. Protöthea: I Want this despite what people say and I'm wondering why it's taking so long to release here when it's a port of a PC game that was released in Europe before. Major League Eating The Game: I could care less for this. I can't believe it's being released in Japan and because they've released it over there, i expect it will come here soon. Frat Party Games - Pong Toss: NOOOOOOOOOOOOOOOOOOOOOOO! I never want to see this in Europe, ever. Groovin' Blocks: I Might consider this when released here as it looks fairly decent. this offer that Tesco.com are doing will have to suffice, at the equivalent of £5.99 per 1000 points. Also, with Home Sweet Home, that probably won't stay EU exclusive for long. As for exclusives to one reigon. It is true most of them are should I say lacking in quality (or just plain uninteresting outside of the original region; I mean Mahjong games don't sell to a non-asian audience becasue they generally don't know how to play it) but the ones which are not it is a terrible, terrible shame others can't experiance them. That is true, you should face up to (and be aware of) the consequences if things go wrong. Also, I would like to say Nintendo is very nice in offering to help (well to be fair its basically waving money in their face) as they could turn round and say tough luck. Still if you like import games it is cheaper than import hardware failing (which won't be repaired and new hardware costs more than £70). US releases on monday is going to be huge, so many games have to come out before october ends. @Terranigma: No game should be more entitled to come over than others. It's better to have the option to buy a bad game than to never have it. Atleast that is what I think. PALGamer: But how many games will turn up (apart from Strong Bad). I'm guessing they'll get Home Sweet Home, but goodness knows about the others (though if it's Alien Crush, I could scream). Would be funny if they got the last artstyle, StrongBad, AlienCrush, HSH and MaBoShi (because the rule one developer game per month is BS). Starwolf_UK: The only advise they will give is too format my Wii which will act like a brand new PAL console. That will fix the issue I'm having with the Wii Shop Channel but all my VC games I've paid for will have gone. Plus I'll be back to using PAL. It's ever a Nintendo issue that's going on or the Region_Changer caused the problem. Until a fix comes out so I can downgrade my Wii, I just have to wait. "No game should be more entitled to come over than others. It's better to have the option to buy a bad game than to never have it." I know that, i was just voicing my opinion of the games, what i think of it and if i want it and what we know about their European release status and for those that are more uncertain, i've made my own conclusions. Just compare the possible repair costs to that before doing it. Even though you're way off-topic; yeah, I'm pretty sure if you format your Wii, your account will remain on your console.